The theme of our second juried show was Blue, that most evocative of colors. Blue. Noun, verb, adjective. An inspiration to artists and songwriters for centuries. The blue of the turban in Vermeer’s “Girl with a Pearl Earring,” Picasso’s blue period, Kandinksy’s “Blue Rider,” Van Gogh’s self portrait in blue, Matisse and Dufy’s Blue Windows... the list is endless. Or maybe you think of music: Gershwin’s “Rhapsody in Blue,” “Blue Suede Shoes,” “Am I Blue?”, the Moody Blues, “Misty Blue,” “Blue Velvet,” “Suite Judy Blue Eyes,” “The Blue Danube.” Or perhaps it’s nature that inspires you to think of blue. The vastness of the sky or the ocean, the blue of a cat’s eyes, or the sweet bluebirds in the fields. 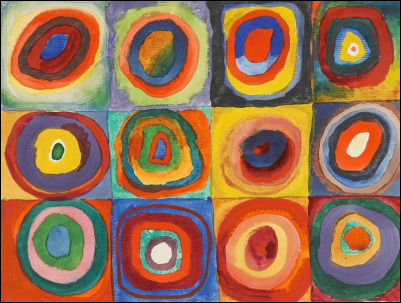 The theme of our first juried show was An Homage to Kandinsky’s Circles. We were excited by the quality and stylistic range of the pieces in the show show. We had paintings, photographs, jewelry, works on paper, works on plaster, glass, encaustic, fiber arts, oils, acrylics, wood sculptures, and more.